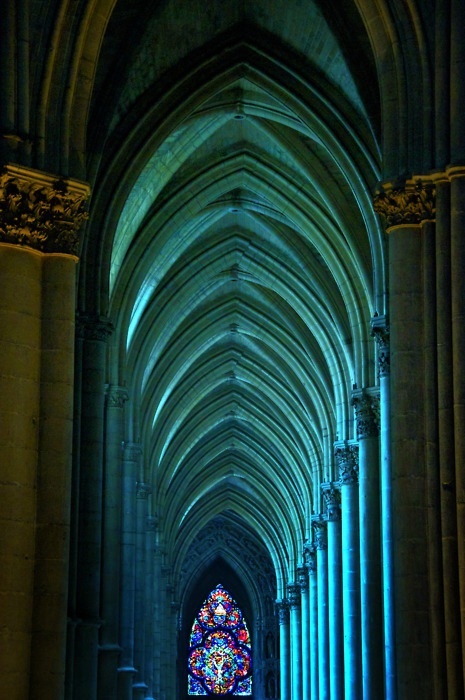 The interior of the cathedral is 138.75 m (about 455 ft) long, 30 m (approx. 98 feet) wide in the nave, and 38 m (about 125 feet) high in the centre. It comprises a nave with aisles, transepts with aisles, a choir with double aisles, and an apse with ambulatory and radiating chapels. It has interesting stained glass ranging from the 13th to the 20th century. The rose window over the main portal and the gallery beneath are of rare magnificence.